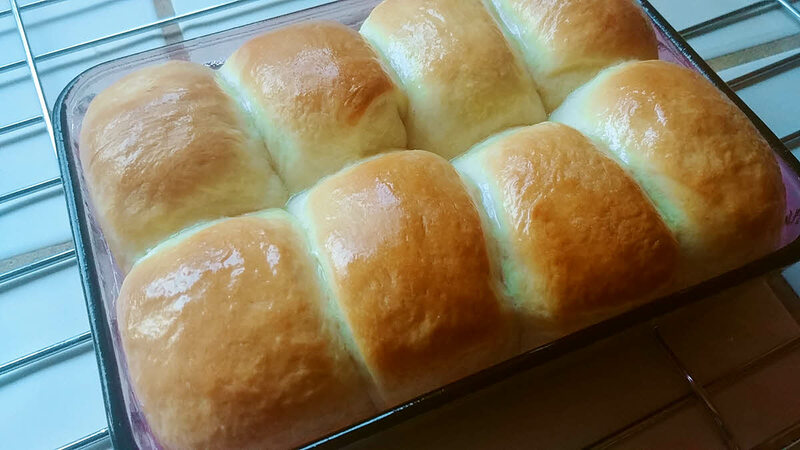 Eggless Pav Buns or Dinner Rolls are so soft and delicious that you just can’t have enough of them. There are many stories as to why these buns or rolls are called Pav. According to one version, the bread is known as Pav because you get it in a set of four and then you break off each mini loaf as you eat and Pav means one-fourth in Hindi. The milk and the milk powder in this recipe give it the softness while butter adds to that silky texture and taste. Although the dough calls for sugar, the rolls don’t feel sweet at all. Combine all of the dough ingredients in a large bowl, and mix and knead using your hands. Use the stretch and roll method until the dough is silky smooth. Place the dough in a lightly greased bowl. Cover the bowl, and allow the dough to rise for 90 minutes, or until it’s about double in size. Gently deflate the dough, and transfer it to a work surface. Divide the dough into 16 equal pieces and roll each piece into a smooth ball. Lightly grease two 8″ round or 4″ x 6″ rectangular cake pans. Place 8 rolls in each pan. Cover the pans, and allow the rolls to rise till they’re quite puffy, about 90 minutes. At this point, you can refrigerate the puffed up rolls to bake later otherwise, preheat the oven to 350°F. Uncover the buns, and bake them for 20 to 25 minutes, until they’re golden brown on top. An instant-read thermometer inserted into the middle of the center bun should read at least 190°F. Remove the buns from the oven, and brush with the melted butter. After a couple of minutes, take them out onto a cooling rack. Serve Eggless Pav Buns or Dinner Rolls warm. Store any leftovers in a box, at room temperature for a couple of days.